The new facility includes housing for residential students and visiting faculty. 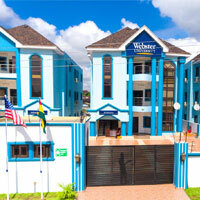 Webster University in Accra, Ghana, has completed its relocation to the business and residential neighborhood of East Legon in the Greater Accra region. Situated in the very heart of East Legon, the beautiful three-story structure is a blend of traditional design and modern technology. Inside its walls are ultra-modern classrooms and other facilities designed to offer an exciting environment for students of diverse backgrounds to live, interact and study together. It also provides housing for both residential students and visiting faculty. Nestled in a university community, the new facility affords students the opportunity to interact with their counterparts from other universities in the area, including the nearly 40,000 students attending the University of Ghana. The move also completes a transition from the original Accra location, where Webster established its first presence on the African continent in 2013 and began offering programs in 2014. With this new location, Webster Ghana will now add the Computer Science program to its undergraduate offerings. This program will add to the campus location's current undergraduate offerings in Management, Media Communications, and International Relations, and graduate programs in International Relations and Business Administration. Plans are underway to introduce additional programs from Webster’s catalog, as well as certificate programs in the next academic year. The new facility and the new programs represent a fresh beginning for a location that offers great opportunities to reach new students in the region and to grow student and faculty mobility throughout Webster’s global network. Set in one of the most dynamic countries on the African continent, Webster Ghana also offers access to U.N. World Heritage sites, cultural displays of traditional drumming and dance, lush eco-tourist environments, and a pool of faculty members from around the world.